Normally I can’t eat a salad for my main meal, whether it be lunch or dinner – it’s just not satisfying enough for me. I may get full, but usually I’m still left wanting something else – like a cheeseburger or big bowl of pasta or stick of butter – just kidding on the butter. No, instead of making me eat less it usually makes me eat more… and then some. Not good. But this salad? 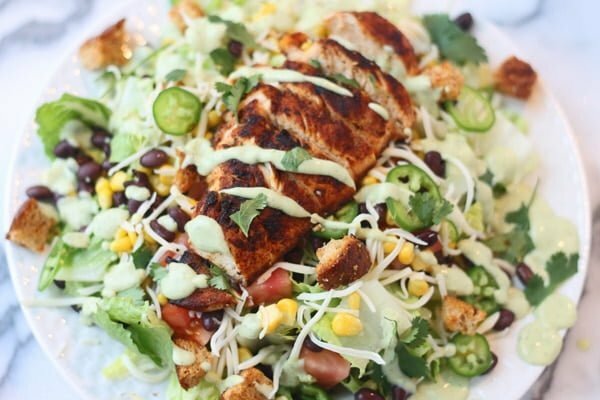 This salad can be eaten for dinner. Hallelujah! Yes, a salad for dinner and you won’t be left wanting to chomp your right arm off. 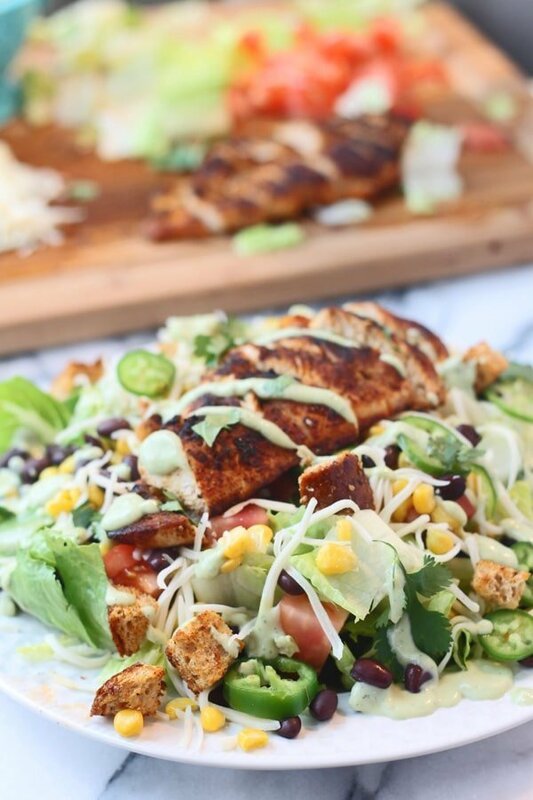 And it’s healthy too – and not healthy in the, restaurant-salad-with-the-blue-cheese-dressing-bacon-fried chicken kind of way, but actually healthy. Even my soon-to-be hubby was cool with this for dinner and (gasp!) said it was the best salad he’s EVER had, EVER people – that’s breaking news in our household – since you know, we don’t eat salads for dinner. Now, to make this a dinner-worthy salad, there are a lot of components, because you can’t just throw some lettuce together with a few veggies and store-bought dressing and call it a dinner salad – that just won’t work, sorry kids. But that doesn’t mean it’s complicated or hard. I guess you could skip a few steps if you feel the need to, like making your own croutons, but I probably wouldn’t do that because ugh the croutons, are a-m-a-z-i-n-g, so yeah, if you can avoid buying store-bought croutons please do, they are infinitely better! 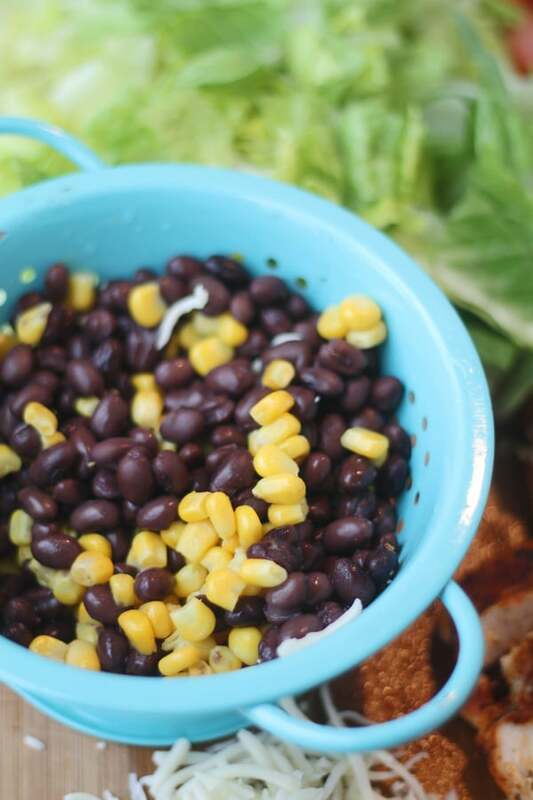 Since it’s a southwest salad, I found it only appropriate to include some black beans and corn – if you have fresh corn, awesome, we don’t have great fresh corn yet, so I used frozen and you can too. Black beans are the canned variety; they are drained and rinsed to wash off all the added sodium and gunk, then dried and ready to top le salad. There are also some chopped tomatoes in there, but you can’t see them. Just an FYI. Now, here are the croutons I was talking about, the ones that you must make. 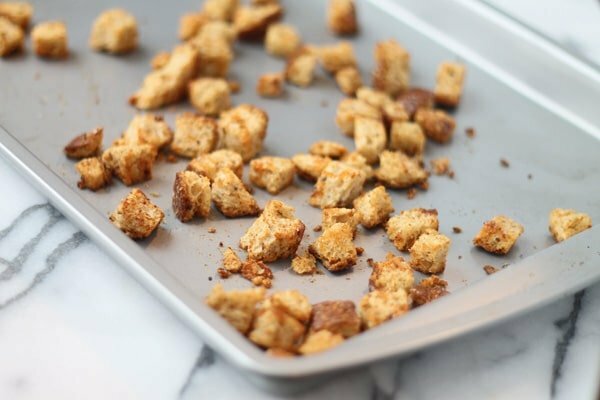 I don’t know if you’ve ever had homemade croutons before (I hope you have! ), but they are so much better than the packaged kind from the grocery store. I usually make a big batch and then keep leftovers in the pantry and pull them out as needed. I cut up whatever old bread I have sitting in the fridge, in this case it was an old whole-grain baguette, but you can use whatever you like, toss in a little oil (I used grape seed oil, you can use olive, canola, vegetable – whatever you’ve got! ), sprinkle with a little salt, garlic powder, and in this case chili powder, bake for a few minutes and presto! Homemade croutons. Next up, the star of the show, spicy chicken. Thin chicken breasts are sprinkled with chili powder, paprika, garlic powder, oregano, cayenne and salt and cooked in a little oil in a super hot skillet, then sliced into strips. 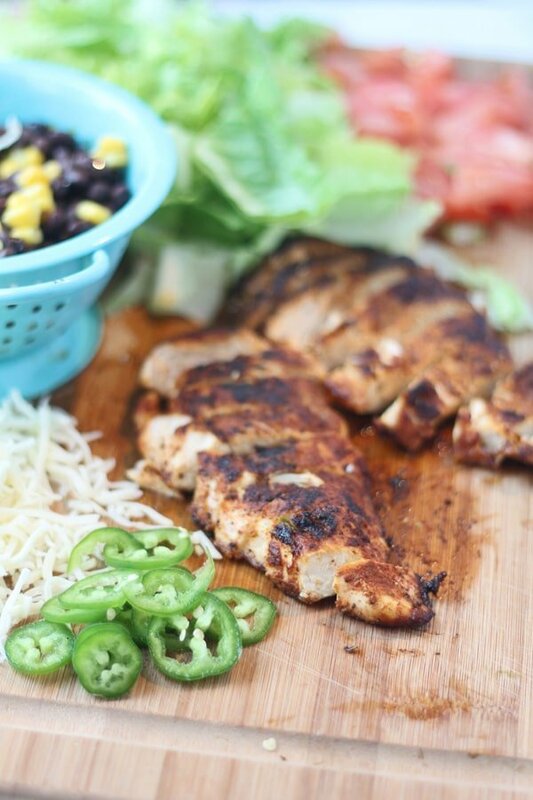 Juicy, spicy and a perfect option for the protein in our salad. Now that we have all our ingredients prepared, we can start assembling. We talked about the corn, black beans, tomatoes, croutons and chicken. All that’s left is a topping of low-fat mozzarella cheese, roughly chopped cilantro, and thin slices jalapeño, oh and the lettuce. Almost forgot the lettuce, I used romaine lettuce since that’s what I had on hand, but any lettuce will work. 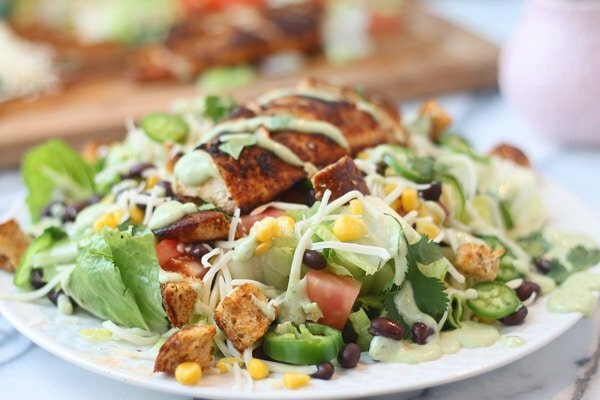 Annd the dressing– so if the chicken is the star of the show then this dressing is its supporting role. A lot of what makes “healthy” salads not so healthy is the dressing. You get all your lettuce on a plate with healthy ingredients like grilled chicken and vegetables and then you pile on tons of super fattening dressing and heaps of cheese, this turns said “healthy” salad into a big plate of lettuce covered in calories and fat, do you really want that restaurant salad now? But this dressing isn’t that, this has minimum fat, with maximum flavor. The secret? 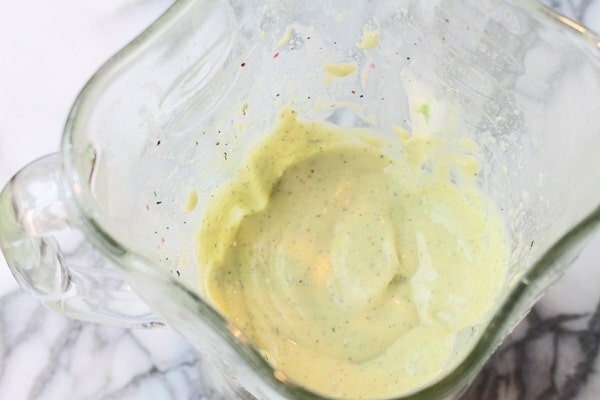 Avocado and buttermilk – the base of the dressing. Avocado, buttermilk, and a hint of low-fat mayo are thrown into a blender along with some flavorful spices including, garlic powder, salt, dried dill, and dried basil. Turn the blender on and presto – dressing done. Salad done. Dinner done. *Note: I know this looks like a LOTof ingredients, but most of them are repeats (in the spice area) and are something you should have on hand. Cut chicken lengthwise to make four pieces of chicken. In a small bowl, combine chili powder, paprika, garlic powder, oregano, cayenne pepper, and salt. Sprinkle chicken evenly on both sides with seasoning. Heath a large non-stick skillet to medium-high with a little oil. Cook chicken until cooked through and slightly blackened, about five minutes per side. Let set for a few minutes. Slice into strips. Pile lettuce onto serving platter. Sprinkle, jalapeño, cheese, tomato, cilantro, corn, and black beans over. Top with sliced chicken breasts, then drizzle with dressing. In a medium bowl toss bread with oil, salt, garlic powder, and chili powder. Spread on to a rimmed baking sheet. Bake at 325 degrees for 5-8 minutes until crisp and lightly brown. If you use fresh bread, they will need to be cooked longer. 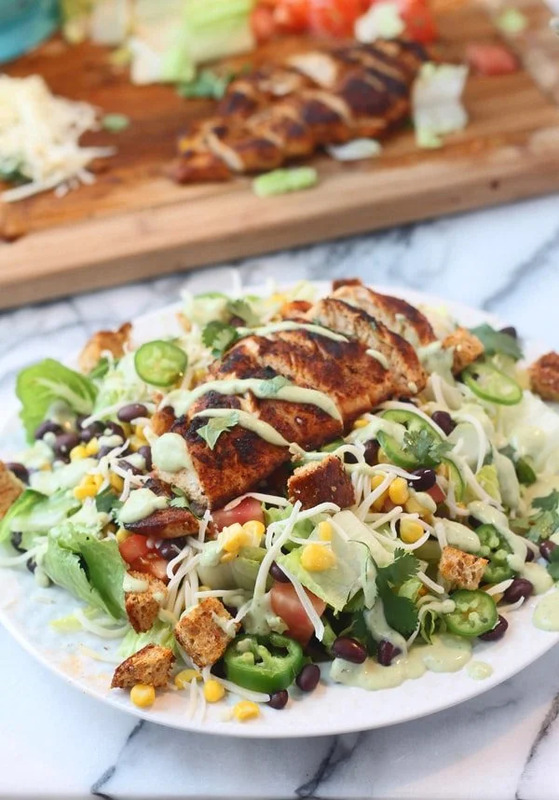 9 Responses to "Southwest Chicken Salad with Healthy Avocado Buttermilk Dressing"
Definitely going to try this dressing…your pictures are so stunning! Great post! I bookmarked your site so I can come back when I have more time. I haven’t tried the dressing or the croutons. I use tortilla chips and low fat sw dressing instead, and the salad is still SO delicious. I split up the ingredients into 5 mason jars for an easy lunch at work. Love! So glad you like it!! Great salad….easy to make….dressing was incredible. So glad you liked it Christina!